This turkey & halibut recipe has two proteins your cat companions will love! The small size of our 3 oz cans makes it easier to mix and match flavors – so you can let your feline friends decide which recipes they like best. AVAILABLE IN 3 OZ CANS. Turkey, Turkey Broth, Salmon Broth, Turkey Liver, Dried Egg Whites, Halibut, Dried Ground Peas, Spinach, Natural Flavor, Guar Gum, Ground Flaxseed, Sodium Phosphate, Salt, Potassium Chloride, Choline Chloride, Taurine, Cranberries, Pumpkin, Blueberries, Dried Kelp, Yucca Schidigera Extract, Inulin, Iron Proteinate, Zinc Proteinate, Thiamine Mononitrate, Vitamin E Supplement, Copper Proteinate, Manganese Proteinate, Sodium Selenite, Niacin Supplement, D-calcium Pantothenate, Pyridoxine Hydrochloride, Riboflavin Supplement, Vitamin A Supplement, Biotin, Potassium Iodide, Vitamin D3 Supplement, Vitamin B12 Supplement, Folic Acid. 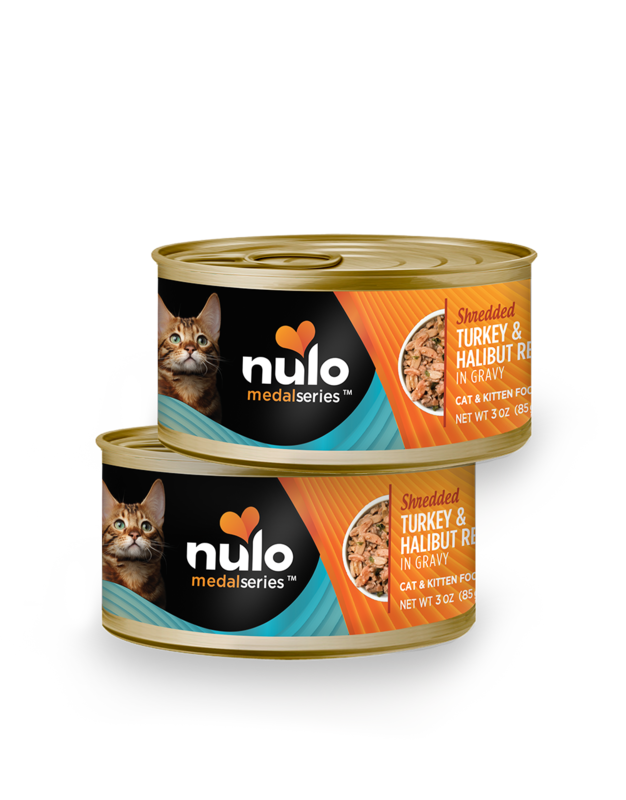 MedalSeries Cat & Kitten Shredded Turkey & Halibut Recipe in Gravy is formulated to meet the nutritional levels established by the AAFCO Cat Food Nutrient Profiles for all lifestages. Not recognized as an essential nutrient by the AAFCO Cat Food Nutrient Profiles. Adult: feed 2-3 cans per 6-8 lbs. of body weight per day. Kitten: feed up to twice the adult amount to kittens. Gestation and lactation: feed up to 3 times the normal adult amount.